- Buy 3 Glade Room Sprays or Solid Air Fresheners, get 1 free. - $0.55 off one Glade product. - $1 off 2 Glade products. 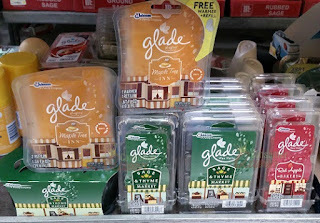 - $2 off 3 Glade products. - 25% off glade winter collection. Shop at a Kroger near you to save $3 on any Glade Automatic spray starter kit. Must present coupon at time of purchase. Print a coupon from Target and save $2 on three Glade air care items. Redeem coupon at register. Save $1 on any two Glade PlugIns scented oil products. See fine print for more information. Print a coupon from target for a $1 discount on glade wax melts.